12.10.14: Is AT&T (T) Now a Bond Substitute ? AT&T (T), fell 3% yesterday on nearly 3(x) average volume, after Verizon (VZ) warned about increased churn and margin pressure in its wireless business, which promptly dropped VZ 4% on Tuesday on nearly 3.5(x) average volume. A small position in VZ was sold on Tuesday (we’ll give it until the January ’15 earnings report to have another look at the fundamentals and guidance) but I also added some T for clients in both bond accounts and balanced accounts, given the current yield on T of 5.5%. The hook was that when I look at the current yield on HYG, the iShares High Yield (junk bond) ETF, which is yielding 5.75% presently, the trade-off between an investment-grade credit dividend at 5.5% versus high-yield current income at 5.75% with energy exposure seems compelling. Frankly, I’d rather own Telco dividend risk here, with T sporting an A3/A- credit rating from Moody’s and S&P (Moody’s has T on creditwatch negative) than below-investment grade credit risk, with the liquidity issues in the high yield bond market to boot. 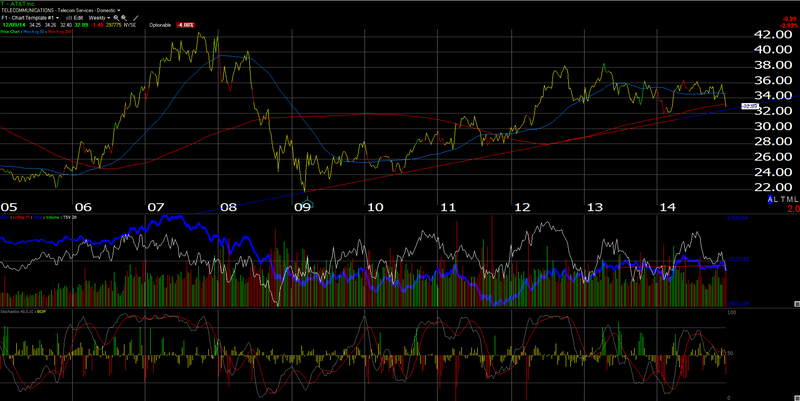 If you look at T’s chart above, the stock is testing its uptrend line off the March, 2009 lows. The early 2014 lows for T was $31.74. We would likely be out of the stock with a trade below $30 on heavy volume, or at the very least reconsidering the long position depending on what else is happening in the US stock market. In terms of disclosure, I have long been an AT&T client, with home and work landlines, as well as T being my cell phone carrier as well as website host. However the price war started by T-Mobile and Sprint makes for a compelling value and pushes against T’s and VZ’s most profitable and growing business, i.e. the wireless biz. Verizon took on a lot of debt with the Vodafone acquisition, resulting in VZ currently being rated Baa1/BBB+. According to my internal spreadsheet(s), VZ sports $107 billion in long-term debt as of 9/30/14, while AT&T’s total long-term debt is $70 billion. T’s debt-to-capital is 28% while VZ’s is nearly 48%. 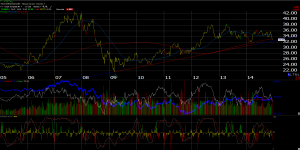 I would like for VZ to trade into the low $40’s before buying it back as a bond-proxy for clients. This AT&T trade may be good for a week, a month or 6 months. Right now I’d prefer to collect a 5.5% Telco dividend than a 5.75% high-yield ETF dividend.